Mir50 Bushing Stock is a (modified) Custom 450® stainless steel that blends toughness and corrosion resistance into one steel. Mir50 Bushing Stock is a precipitation hardening, martensitic stainless steel. Typical hardness is Rockwell “C” 26/30. It is offered in a rough machined condition both OD and ID for proper clean-up allowance. Excellent serviceability in a variety of industrial applications for food processing, chemical and paper industries. Well-known as the “4340 of the stainless world”. Agency concurrence includes API-6A, FDA, AMS-5763 (chemistry only) and NACE MR-01-75-097 revision. 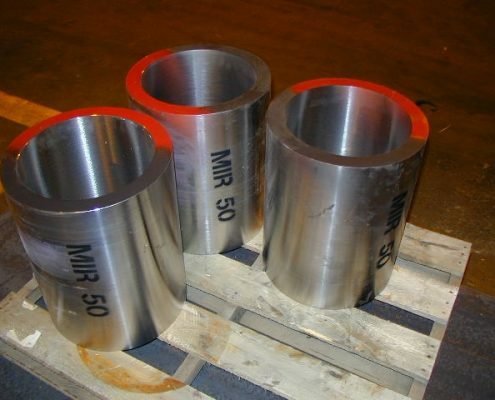 Consider using Mir50 Bushing Stock in place of certain commercial grade stainless steel including: 416, 410, 17-4PH, 304L, and 316L depending upon the requirement. Call or email us for a quote. Corrosion Resistance – similar to that of 316L Stainless, Mir 50 Bushing Stock is engineered for use in severe service applications. Most commercial stainless grades fight corrosion but lack strength. Alloy grades and hardenable stainless grades have strength but lack corrosion resistance. Mir 50 Bushing Stock does both. High Strength – is a thermally hardened martensitic stainless alloy. It has similar strength levels like a 4340 Q&T alloy bar product with approx. 140KSI tensile strength. Austenitic grades, such as 304 and 316 stainless, require strain hardening or cold reduction to obtain their hardness. Double Stress Relieved – shipped virtually free of retained stress and has “low memory” properties, this material will not exhibit the “movement” and “walking” commonly experienced when machining 304, 316, and other stainless grades. Ease of Machining – it is not gummy, and it will hold a bright finish. Non-Galling – Mir 50 Bushing Stock is non-galling. It is compatible with almost every other stainless grade, as well as carbon and alloy grades of steel. 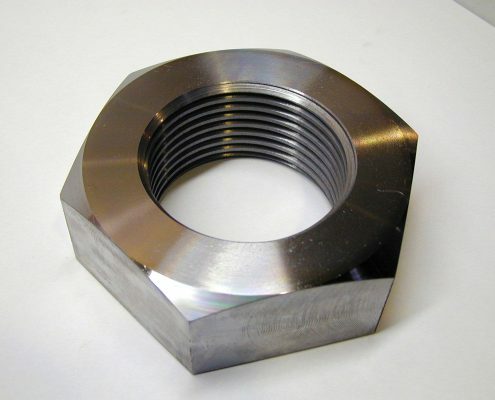 Maintenance people will find that hex nuts, caps, and collars come apart easily for inspection, replacement and repair. *Rough Machine with Allowance For Proper Clean-Up. Call for other sizes and configurations. To maintain the unusually high degree of toughness, service temperature should be limited to approx. 800°F, although Mir 50 exhibits excellent oxidation resistance to 1200°F. Custom 450® is a registered trademark of Carpenter Technology Corporation. NASS 45® Bushing Stock is the past protected tradename of North American Steel Company.